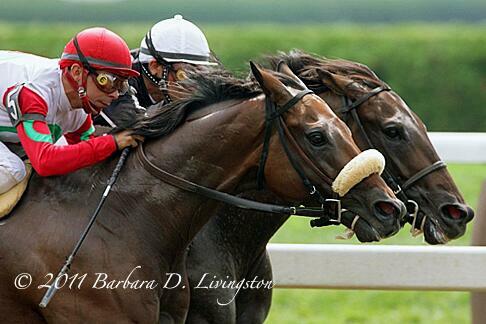 Earlier this week, perhaps in anticipation of this afternoon’s Spooky Mulder Stakes at Aqueduct, Barbara Livingston posted a photo of Spooky himself, dueling with fellow game gelding Callmetony at Saratoga in 2006. Spooky Mulder and Callmetony, copyright Barbara Livingston and used with permission. Tony was a spritely five-year-old back then, Spooky an older, wiser eight-year-old. The race was Spooky’s 66th; Tony had raced in exactly half as many, winning seven and coming to the race on a two-race winning streak. Spooky was used to the winner’s circle, having visited it 27 times prior to this meeting. Both had earned their money the hard way, racing regularly, changing barns frequently; they were popular on the claiming circuit, and virtually until the time they were retired, they got checks for their owners, often finishing in the money even when the winner’s circle got a little more elusive. Spooky last raced in July of 2009, at the age of 11, at Delaware Park. His last trainer was Scott Lake, who’d had him a little earlier in his career, and Spooky’s first retirement home was with Lake’s mother-in-law, who gave him to her best friend, a lifelong horsewoman named Sally Rohrbach. He’s lived happily in Harwood, Maryland since then, first with two miniature horses for company, more recently with another retiree. He never lets his buddies forget just who exactly is the boss. Spooky retired with a record of 34 wins, 17 seconds, and 4 thirds from 85 starts. He earned over $950,000. In June 2012, Callmetony made what would be his last start, at Parx; Roddy Valente had claimed him three times earlier in his career, and he claimed him one more time, retiring him and sending him to the good life at Akindale Farm in Pawling, New York. A placid fellow, he was placed in a paddock with Hotstufanthensome, who had rejected a series of potential buddies since taking up residence at Akindale; now, the two are inseparable. Tony (called with affection “Call Me To New York” by some of his fans) also raced 85 times; his record was 21-22-17, his earnings more than $666,000. They were both known for their guts and their heart on the racetrack, and they’ve both, thanks to connections who took care of them, landed in cushy retirement, surrounded by people who love them. Stories & photos from visits with Spooky in October 2010 and summer 2012; David Grening wrote an update this week. Click here for the story of how Callmetony got to Akindale. Many thanks to Barbara Livingston for her permission to use her photo. Thanks for the update on these old warriors! Nice to see them both get a well earned happy retirement.